1. Non-Destructive Testing means the method of finding defects or malfunctions in the object without causing any damage to them. 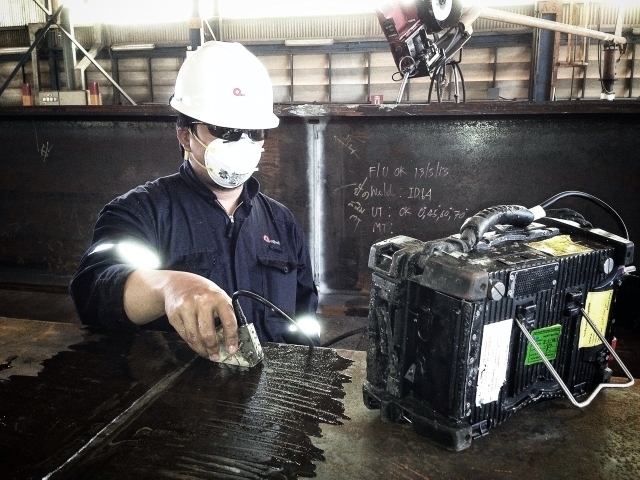 It includes radiography, ultrasonic, magnetic particle, dye and liquid penetrant test, and other advanced tests. 2. Inspection and Certification is a continuous or add-on process from the Non-Destructive Testing by using different testing methods, including non-destructive testing, to inspect objects and evaluate as well as issuing reports certifying the serviceability of the tested samples with a conclusion to ensure the suitability for usage. Inspection and certification includes, for instance, inspection and certification pursuant to the laws for LPG and NGV tanks, piping, boilers, fixed tanks oil storage tanks, and fuel & chemical transportation tanks. 3. Mechanical Test is a test that determines the physical and chemical property of materials such as tenacity against stress, pressure, acute force insertion, metal particle structure, and chemical components which affect the key property of the metal in term of strength and deterioration. The Company provides services to both domestic and foreign clients. The Company’s main clients are businesses in the energy industry and petrochemical such as power plants, oil refineries, petrochemical plants, gas separation plants, gas filling plants and plants for manufacturing and installing machinery equipment; as well as users of tanks, machinery, equipment which must be inspected in accordance with the law to ensure safety such as boilers, cranes, dangerous gas tanks and high pressure tanks. The clients for non-destructive testing, inspection and certification and those of mechanical test can be distinguished. 90 per cent of the non-destructive testing clients belong to a group of project contractors which the Company is their subcontractors for NDT service. For inspection and certification, 70 percent of customer is a direct owner of the project who regularly run annual factory test, during major maintenance, and inspection and certification to comply with the regulations. The customer group for mechanic testing are equally both project contractors and project owner.